Pregnancy is a significant challenge. Many women are plagued by anxiety and doubts. After all, they want to do everything right – especially when it comes to having their first child. For this reason, many women ask themselves whether attending childbirth classes prior to delivery can help. Below, you’ll learn what such classes cover, what benefits they have for giving birth and what kinds of offers are available. Childbirth classes are intended to support a woman throughout her pregnancy as best as possible and provide important information regarding delivery, the postpartum period, breastfeeding and everyday life with a baby. In addition, advice about choosing the right place for delivery, the birth plan – including coping with contractions and pain relief – as well as information about different birthing positions and tips on how to react to stressful situations are offered. The role of the partner during pregnancy and delivery is also discussed. Proper breathing, body and relaxation exercises that are taught during the course round off the offer. Quality classes also prepare expectant mothers for life with a baby after birth as well as for possible challenges and problems that may arise. Another great advantage: Expectant mothers can meet other pregnant women and get valuable advice. Today, a wide range of class types is available to pregnant women. There are individual or couple’s courses, which women can visit together with their partner. Offers range from yoga to belly dance, gymnastics, preparing for a water birth and hypnobirthing. The classes are usually held at a hospital or related facility or at a private practice. For experienced mothers who already have somewhat of a routine, special refresher courses are available. In most cases, childbirth classes are taught by a midwife. Courses teaching this type of birth preparation have been offered since 1989. The American Marie F. Mongan is credited as the inventor of this method in which the focus is on self-hypnosis and deep relaxation. The concept: Anxiety “blocks” the body and creates tension in every muscle, including the uterus. For a pain-free birth, relaxation is crucial. The art of self-suggestion is supposed to teach the expectant mother how to relax, thereby alleviating anxiety and physical tension. In the course, four basic techniques are taught: breathing, visualizing, relaxing and deepening. Childbirth classes are very popular and therefore well-attended. For this reason, it’s important to sign up for a course in time – ideally before the 20th week. The best time to take a course is between the 28th and 30th week of pregnancy so that you can complete the course three to four weeks before your estimated due date. How Long Are Courses Generally? Many courses last for a few weeks or months and usually take place once a week in the afternoon or evening. Others can be completed in just one weekend. Most courses are held for a fixed group and therefore require registration. A group should have approximately 8 to 10 members to ensure that adequate support is possible. Generally, a complete childbirth course lasts 14 hours and is broken down into at least two or more days of classes. A study from Iran investigated the influence of childbirth classes on the health of the mother and baby. For the study, 200 women under the age of 35 who were pregnant for the first time were divided into two groups: one study group that attended childbirth classes and a control group that did not attend classes. The result: The participants of the study group suffered significantly less back and pelvic pain as well as fewer headaches than those in the control group. Attending childbirth classes is closely linked to a smoother delivery process as well as a lower number of caesarean sections. A different study from Tel Aviv examined the effects of childbirth classes on the anxiety and self-confidence levels of pregnant women who hadn’t given birth to a child before. For the study, 31 women attended a 5-week childbirth course, and 39 women attended a two-week course. A control group with 32 women did not participate in a course. The level of anxiety and the level of self-confidence were measured before and after the childbirth course. The result: After the completion of the course, the level of anxiety decreased significantly in both course groups. The level of self-confidence, on the other hand, did not change. The overall evaluation of the results showed that, although they had no effect on self-confidence, the courses were an anxiety-reducing factor. What Do Childbirth Classes Cost? In Germany, health insurance companies assume the cost of 14 classes if the course is taught by a midwife. Partners who would like to participate as well usually have to pay for the course themselves. In Austria, childbirth classes are not covered by statutory health insurance and must therefore be financed by the pregnant woman and/or her partner. Depending on the type of course, the cost lies between 100 and 150 euros. 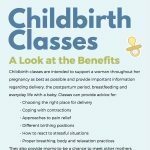 How Can I Find the Right Childbirth Course? Since every woman has different needs, it’s important to be informed about the offered courses as well as their content and duration in advance. Corresponding information can be obtained from your midwife or your gynecologist. Health insurance companies and hospitals are also competent contacts for information. In many cases, you can learn about courses and dates online.